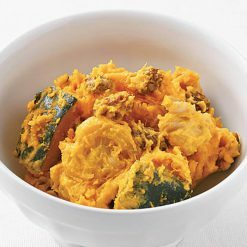 This salad features a delightful mixture of the sweetness of kuri kabocha pumpkin with the textures of walnuts and raisins. Each package is 130g and arrives frozen. Kabocha pumpkin, also called kabocha squash, is a variety of squash very popular in Japanese cooking. This item is made with Kent variety kuri kabocha pumpkin from Hokkaido (the same variety as Sugarlady item 1041, “Kuri kabocha pumpkin from Hokkaido”). It is soft, flaky, and very sweet. The kabocha pumpkin in this salad is in large pieces, allowing it to be clearly seen and tasted; and the pieces retain their skin. This item features an original sauce with a delicious balance of sweet and sour (made from kuri kabocha paste, cream cheese from Tokachi, and mayonnaise) that pairs well with the kabocha. 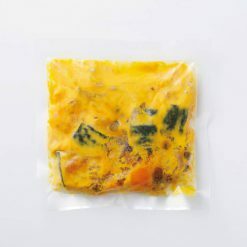 The solid kabocha pieces plus the kabocha paste make this item about 80% kabocha (about 104g of the item’s 130g total). No potatoes were added to this item. The walnuts are left solid to enhance their texture in the salad. The texture and flavor of the walnuts, too, pairs well with the kabocha. The sweetness and the mild sourness of the raisins serve as accent flavors. The walnuts and raisins are added to the salad last so that their texture remains intact. Defrost in the refrigerator. To defrost more quickly, place the salad in its bag beneath running water. Once defrosted, transfer the salad to a bowl and it is ready to eat!It is also delicious eaten with bread as a sandwich. To make the kabocha pumpkin salad into a sandwich, we recommend pairing it with Sugarlady item 2571 (“Graham bread”). This product contains kabocha pumpkin (Hokkaido), kabocha pumpkin paste (Hokkaido), cream cheese (Hokkaido), mayonnaise, walnuts (USA), raisins (USA, California), (this product contains soybeans and apples).. This product is not suitable for anyone with allergies to egg, milk, walnut, soy or apple. Origin of ingredients: kabocha pumpkin (domestic), walnuts/raisins (USA). Prepared and packaged in Japan.